The Internet has one more social video network for you to join so that you can put your pretty face online, interact with friends and answer questions. 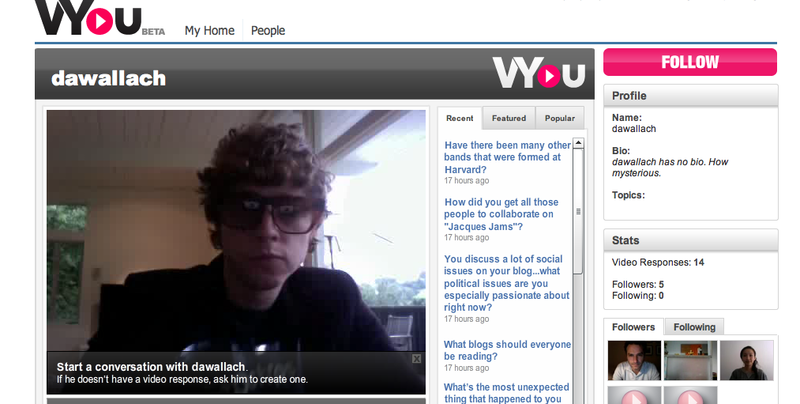 It’s called VYou.com, and it’s being described as a combination of Formspring , YouTube , and Twitter. I may as well throw Justin.TV meets Quora in there too. VYou lets you get advice from experts, interact with your favorite celebrity or organization, or communicate with friends and family using a social presence that persists even when you’re away. As a simple application it can be embedded and posted anywhere on the web giving you tremendous power and creative control. Where the likes of Twitter and Youtube have paved the way, VYou is the next generation in social communications to an online audience. VYou enables video conversation, allowing users to send and receive messages with friends and experts in a casual when-you-can-find-the-time fashion. Users can follow other users a la Twitter, ask questions and post responses accordingly a la Quora. Founded by Steve Spurgat and Chuck Reina, VYou is a New York-based start up that is angel-funded and still currently in beta mode so users must wait a few hours before receiving full membership access. Sign up is easy and users can link their accounts with both Twitter and Facebook. Users are asked to pick three categories that they are experts in like science, technology, media and publishing, food and wine, travel, etc. Then users must record a “Waiting” video and “No Response” video which users and followers can view as they wait for answers. 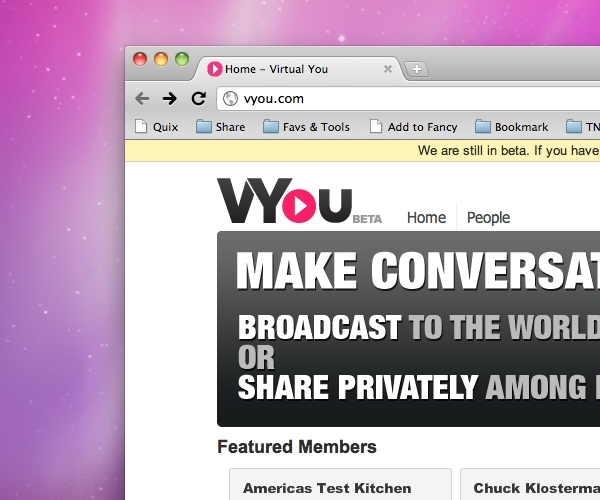 VYou is similar to the old Seesmic, which aimed to promote online video conversations and the recently closed 12seconds.com, which was a Twitter-like video status service that gave users 12 seconds to share video moments from their life. Seesmic has since refocused its site to feature a suite of tools that aggregates content from other social networking sites such as Twitter and Facebook. VYou as a technology is also competing with LA-based start ups Yowie and Vokle. Both start ups offer other sites a moderated and live platform where their users can interact via video and chat. Yowie, which launched at Comic-Con, focuses on entertainment while Vokle, which has successfully been implemented on the Huffington Post is more media focused. Similarly, New York’s Flavorpill.com, a lifestyle website plans to use VYou to power their “Interactive Video Interview Program” where editors will interview celebrities on the Flavorwire blog. Video isn’t just on the rise. It’s here and it’s exploding, mostly due to the fact that almost every device (with the exception of the iPad and other tablets, booo) now comes with web cam functionality. Video breaks down the barriers of 140 characters and adds a layer of intimacy to our often inane online social interactions. Next steps for VYou include improving its search function and expanding to multiple platforms, including mobile. A sampling of VYou’s content provided by VYou investor and advisor Rex Sorgatz: Alex Blagg defining “strat.” Chuck Klosterman telling you the best color for a horse. Lauren Leto denying her Bukowski phase. Lauren Lane telling you the difference between a straight and a flush. Anna David letting you know if friends can date. America’s Test Kitchen on pitted versus non-pitted olives.